Examine the rings to make sure they are securely sewn in each time you use the sling, as they will be holding the weight of your child. 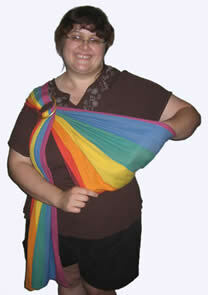 Determine which side you want to wear the sling on – usually the side on which you want your hand free. 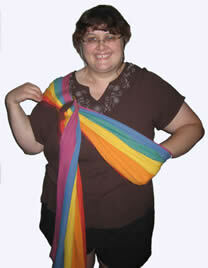 I'm right-handed, and like to have my right hand free, so I usually wear my sling on my right shoulder. Hold the rings in that hand (mine go in my right hand). Put your other arm through the loop of the sling. 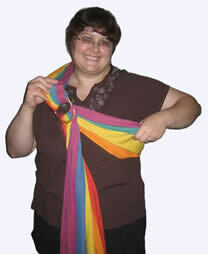 Bring the sling over your head, keeping the rings close to your shoulder and putting your other arm all the way through the sling, like a sash or across-the-body purse (or an arm sling!). Positioning the rings correctly goes a long way to comfortable sling-wearing: if they are too high on your shoulder, the rings will dig into your skin. If they are too low, there's not enough room for the baby in the body of the sling. I like mine to rest at the hollow between my shoulder and my breast. This is sometimes referred to as the "corsage position". Also be sure that the sling doesn't ride up off your shoulder and towards your neck. This leads to back and neck pain. The pleats should help prevent this. Spread the material out over your shoulder. The pleats will keep it from spreading out too much. 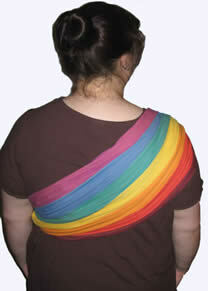 Generally, the fabric should cup the point of your shoulder and spread out evenly over your back. The higher on your shoulder the rings are, the less the fabric can spread out, so if you have particularly narrow shoulders you may want to wear the sling with the stitching close to the cusp of your shoulder. 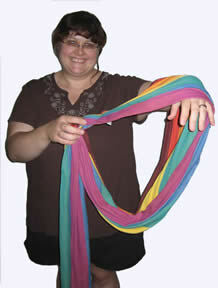 After you have the sling in a good position, hold onto the rings with one hand while you tighten the sling (pulling the tail) with the other hand. It helps to tighten the sling so it's rather snug before you put the baby in, with just enough "give" to allow you to put the baby in; with a stretch fabric, that can be quite snug. I find it's much easier to adjust a sling if I start with it as close to the final tightness as I can.